LCOE for Hydro Projects – Pick a number, any number! One of my pet peeves has been a metric with the glamorous acronym LCOE which stands for Levelized Cost of Electricity. This is the “go to” number when evaluating electricity generation sources and comments about solar and wind reaching “grid parity” relate to this measure. These figures are similar to others I have seen published in many places and they have never made any sense to me. My parents had a cottage on Lake Agnew in Ontario which was formed by the building of the Big Eddy dam in 1929. There are 5 other smaller dams within a short distance and I know that they are all still operating and producing significant value for their owners. Several are more than 100 years old and will not be decommissioned in the foreseeable future. So it is clear to me that these dams produce the least expensive electricity that can be generated from any source. Why then is it that LCOE values for hydro are not dramatically less than other renewable sources? After some investigation it has become clear that this is an issue that has a lot more to do with politics and “spin” than it does with anything meaningful. And the same problem applies to any capital intensive project that has a very long service life (for example, solar thermal with molten salt storage which has a major advantage over solar PV because it can generate electricity 24 hours a day to meet peak demand). In this post I will focus on the “Site C” dam in British Columbia, currently under construction. For this particular project is is possible to say that the LCOE is $164/MW-Hour or $31/MW-Hour – neither statement is factually wrong but one is more realistic and more likely than the other (Note: all figures in this blog post were updated Dec. 12, 2017 to reflect an increase in the estimated capital cost for the dam – from $9.1 Billion to $10 Billion). The large discrepancy in LCOE values demands an explanation. The major factors underlying this wide variation in values for LCOE are the cost of capital, the time period being considered, and the forecast capacity factor for the dam. Anyone that has purchased or has considered purchasing a house understands that the longer the amortization period the more you will end up paying for your house. If you paid your mortgage off in 20 years at a 6% interest rate you would end up paying about 1.8 times the purchase price (the total interest paid would amount to about 80% of the purchase price). If you paid the mortgage over 35 years at a 6% interest rate you would end up paying almost two and a half times the purchase price (note that I use 6% as the interest rate = discount rate because that is the BC Government mandated rate for assessing large capital projects). Given that reality why would anyone choose a 35 year amortization period rather than a 20 year amortization period? Why? – because longer amortization periods require lower monthly payments. As a result there is always a trade-off between what a house purchaser can afford to pay each month and how much they will spend in total to purchase the house. So imagine if you paid off your house over 70 years. Most houses are still being used for at least that length of time. Many houses in Europe are hundreds of years old. 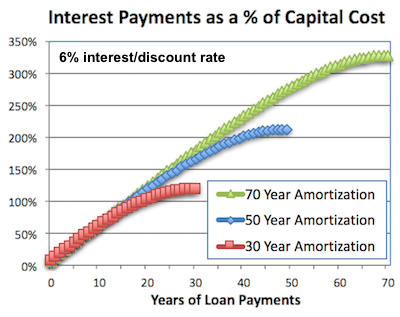 Choosing a 70 year amortization period would reduce your monthly payments even further but at a 6% interest rate you would end up paying over 4 times the purchase price for your house. That doesn’t make sense and banks don’t offer mortgages for more than 35 years. But that amortization period is exactly what is used in the most commonly published LCOE values for Site C.
Now you might wonder why BC Hydro would choose that approach when it clearly results in the highest total cost for the Site C dam. Well, if you need to present the lowest LCOE during the amortization period then longer amortization periods give you lower numbers. That doesn’t make sense but the optics are better. For example, if you used a more realistic amortization period of say 30 years the LCOE during that 30 year period would be around $138/MW-Hour. That is not a very attractive number. It also does not reflect the true cost of electricity that will be produced from this dam. In order to understand the true long-term LCOE it is necessary to consider the period of time after the capital cost for the dam has been paid off (end of the amortization period) until the end of life for the dam. How long will the Site C dam be in operation? There are many hydro dams in the world that are more than 100 years old and operating just as efficiently as when they were constructed. Personally, I think most of these dams will be in operation in a thousand years. Why wouldn’t they be? (the Cornalvo dam built by the Romans is over 1,800 years old!). However, projecting service life beyond 100 years is a bit speculative so let’s leave it at 100 years. That’s what BC Hydro has done in published materials for Site C.
If a 70 year amortization period is used then the only costs for the dam over the last 30 years are operating and maintenance expenses which are very small compared to the capital cost. Although it is again highly speculative to try and forecast O&M expenses 70 years from now reasonable guesses result in LCOE values of $5-10/MW-Hour. Combining the costs during and after the amortization period for the Site C dam results in LCOE values of around $75-90/MW-Hour. But what if a more realistic amortization period of 30 years is used? BC Hydro could easily borrow that amount on capital markets or issue bonds with that type of maturity. In that case the LCOE during the first 30 years (assuming 6% interest/discount rate) would be $138 but the LCOE taken over the full 100 years would be about $45/MW-hour. That’s a much more attractive number. It will likely even be better than that. The LCOE values quoted so far have been based not only upon 6% interest rate but also using a capacity factor of 55%. That is to say that the dam would only produce 55% of the electricity that it is capable of producing. The capacity factor will depend upon demand and water conditions. Within the next 100 years all automobiles will almost certainly be electric drive which will significantly increase electricity demand in the province. But we also need to stop burning natural gas to heat our homes and businesses. The renewable alternative is heat pump/geoexchange technology which requires considerably more electricity than traditional heating systems. Burning huge quantities of diesel fuel in our railway locomotives also doesn’t make a lot of sense if we are trying to de-carbonize our economy. Electrification of the railway system will add another significant new load on the electrical system. Finally, if Alberta follows through on its commitment to eliminate burning coal to generate electricity then there will also be additional demand on BC hydro power as a balancing resource for wind farms. Taking all these new system loads into account and barring a drought it is conceivable that the capacity factor for the site C dam could increase to as much as 75%. And what about interest rates for a large loan? BC Hydro would be able to obtain capital at the most attractive rates possible for a loan of the size required for Site C. BC Hydro could issue a Site C 30 year bond at a rate of 4.5% which would be competitive with other high quality debt instruments. 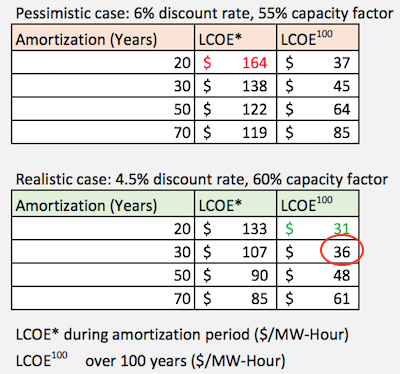 Using an interest/discount rate of 4.5%, an amortization period of 30 years and a capacity factor of 60% would yield LCOE of about $36/MW-hour over 100 years. In my opinion that is the most realistic and likely LCOE for the Site C dam. The tables below provide other values which indicate the sensitivity to amortization period, interest/discount rate, and capacity factor. It it clear to me that hydro, amortized over a reasonable period, is by far the least expensive renewable resource available. More importantly, hydro power is available when it is needed each and every day because of its ability to follow system load. The only other renewable technology that can do that is geothermal and it is not available in most geographic areas (hydro-kinetic turbines would also be able to provide that kind of reliability and that technology deserves R&D funding and other financial supports). For solar PV and wind it would only be reasonable to add a significant additional cost for energy storage or some other reliable generation source to provide power on calm nights. Those critical additional costs are conveniently ignored when comparing LCOE values for solar, wind, and hydro. As a result claims of “grid parity” for solar PV and wind are nonsense. Solar thermal with molten salt storage, on the other hand, is becoming a reliable and cost effective generation source in subtropical regions as demonstrated by a recent project by Solar Reserve being built in Chile. One final note. 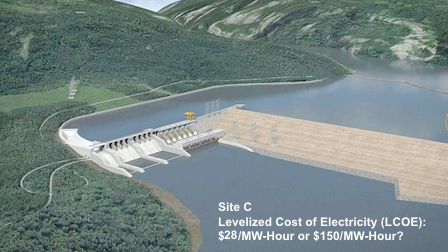 It can be argued quite reasonably that those of us who will “shuffle off this mortal coil” before the Site C dam has been paid for will never see the benefits of the low cost power this dam will generate for decades or perhaps centuries in the future. So be it. We have, without question, enjoyed and will continue to enjoy some of the world’s lowest electricity rates because of the investments made in dam construction decades ago. As far as I am concerned I can imagine no greater legacy for our children and grandchildren than a source of clean, renewable energy that will last for their lifetimes and beyond. I have complained previously about the misrepresentations published about renewable energy. In most cases the authors just seem to be so overcome with excitement about some new milestone achievement so that they lose sight of the big picture. But I recently ran into a post from 2016 that demonstrates more clearly than anything else I have read just how foolish these articles are. The above statement is not true but it is not exactly a lie either. A few paragraphs later there is another statement which only confuses matters further. The article goes on to state that German consumption has been flat for a number of years and that in 2015 exports reached a new high of 60 TWh, an increase of … wait for it … 31 TWh – almost exactly the same amount as the increase in renewables in 2015. That is not a coincidence. The last paragraph of the article speculates that the exports are from coal-fired plants when renewables are generating a lot of electricity. That happens primarily mid-day in the spring and on windy nights. Attributing all exports to coal-fired plants is nonsense. An electron is an electron regardless of how it was generated. The reality is that exports take place not because Germany’s neighbours need or want German electricity – up until now they haven’t had any choice but to deal with excess power dumped onto the regional grid by Germany’s uncontrollable renewables. That situation is changing as Germany’s neighbours begin to install devices to limit the flow of electricity between countries. Upon completion of those projects it could well be that German wind producers are forced to curtail the generation of electricity. That is already happening in Denmark where wind farms are paid not to produce power. To my way of thinking there is some irony in the fact that within the Euro zone there is free movement of people but soon electrons will have to show their passports to cross national borders. Considering the export situation it would be accurate in the first paragraph of the article to state that renewables represented 32.5% of German electricity production. To say that it represents the same percentage of German consumption is, at best, misleading because exports increased in lock step with renewable electricity generation. The article also implies that coal-fired generators are “hanging on” by turning to the export market. 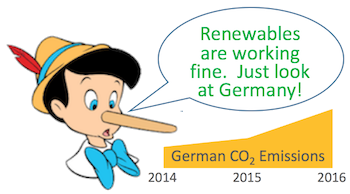 The fact of the matter is that Germany’s coal-fired plants have to keep running so that they can provide power when wind generation disappears, which happens often. Utilities would actually prefer to operate their super efficient, low CO2 emissions Combined Cycle Natural Gas plants but they can’t afford to. Given that Germans already pay some of the highest retail prices for electricity in the world (largely because of levies to support the development of renewables) there is no appetite for the introduction of more expensive generating sources. It is clear from developments over the past several years that increasing wind capacity in Germany further is literally pointless. When winds are blowing strongly there is already far to much electricity being generated and when winds are calm Germany has no choice but to burn coal – a lot of coal. 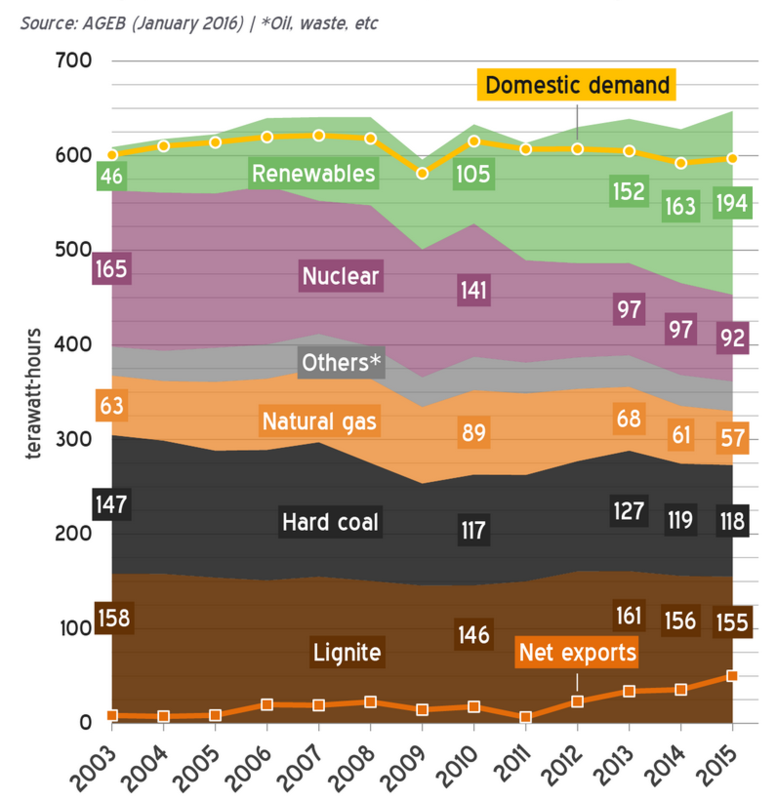 Given that the amount of coal burnt has actually increased over the past 6 years even as Germany built out the lion’s share of its solar and wind capacity, it is obvious that Germany has not managed to reduce its dependence upon reliable fossil fuel based thermal plants. It seems highly unlikely that the planned decommissioning of nuclear plants can continue unless there is a corresponding increase in coal-fired or natural gas-fired generation which would completely blow up Germany’s CO2 emission reduction goals (see this very comprehensive review of the situation for more details). The lesson of the Energiewende is that some solar and wind can be introduced into the grid without causing too many problems as long as reliable generating assets are all maintained. But at some point the costs of adding more renewable generation far outweigh any possible benefits. The situation reminds me of the iconic cartoon “The Sorcerer’s Apprentice”. Getting one enchanted broom to help out with the chores is awesome. But having an army of out-of-control brooms doing the same thing just leads to a lot of spilled water. That’s where Germany is at. Just not as entertaining to watch. For some ideas on how we actually can make the transition to a future powered by renewables check out my Sustainable Energy Manifesto.